If you've been around here long enough, you'll remember the Edible Garden Project series I used to write. At the end of last season, I decided to end the project on this site and focus in on all things travel. However, I certainly never stopped growing edibles and building upon my gardening skills. Total honesty? Our garden is hideous right now. Truly hideous. It's been suffering from a total lack of attention, as has the rest of our yard. But that tends to happen when you end up on the road a lot and spend time doing other things like recovering from the flu, designing your website, and celebrating other various events. We did take the time to harvest the rest of our summer bed. The bowl of beets and carrots were juiced. Since we ended up with loads of green tomatoes - we tried the internet myth of putting them in paper bags in a dark place. And it worked! Well, at least sort of - for about half of the tomatoes. The other half I roasted with a little olive oil and sea salt and it was super tasty. This year, my high travel season seems to have coincided almost exactly with the most productive time of year for our garden. When we returned from our Canadian Rockies road trip, our garden was brimming with red, orange, and green. Unfortunately, I only had about a week at home before heading out on the road all over again for another two weeks. So in that short week, we harvested as much as possible. As I had planned, this year I started experimenting with making sauce out of our tomatoes. The Sun Sugar tomatoes were cooked into a fresh puttanesca sauce and a combination of Amish Paste and Brandywine varieties were cooked into a basic sauce using this recipe from the Kitchn as a guideline. The Walla Walla onions, which by the way I plan to grow every year from now on (so easy! ), were caramelized for French Onion Soup, eaten on top of pizza, and cooked into chili. Lastly, those beautiful carrots were slow cooked with chicken breasts and shredded for our pup (I know, she's spoiled). In general, I've been very hands off with the garden this year. Lots of unexpected things have come up and I just haven't had the time to be as attentive as I'd like. I am, after all, a rather lazy gardener with purposefully low expectations. That being said, at the beginning of the month there was only one tomato each on the Brandywine and Amish Paste plants. So, I decided it was time to give pruning a try. 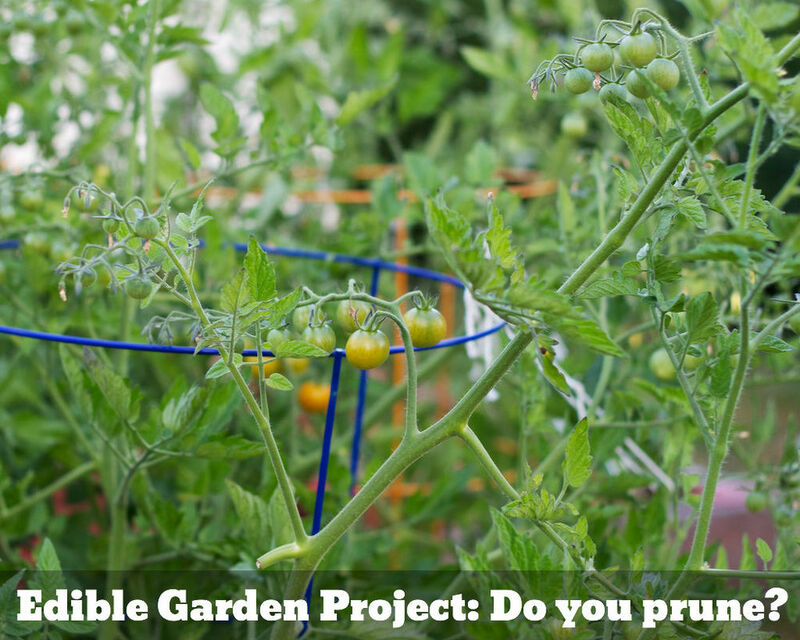 The idea behind pruning is that you get more good nutrients going towards producing fruit by cutting off some of the excess foliage which is taking away that energy and fuel. I ended up removing most of the lower branches as well as most all without flowers all around the plant. In the last two weeks our garden seems to have finally taken off. Especially when I look back last month's update, our plants have had a major growth spurt. Our middle raised bed in particular has become somewhat of a jungle with the combination of Tuscan kale, tomatoes, beets, onions, and carrots. To be honest, aside from some very interesting weeding to be done - I haven't really done much garden work or up keep in the past month. Perhaps the only thing that has caught my attention are the tons of tiny tomato sprouts, not that we planted, appearing in that middle bed. So that's my new lesson learned for the month; when planting tomatoes in raised beds, expect lots of volunteers the next season. Other volunteers from last years planting include New Zealand spinach and Echinacea.